Courage is measured one step at a time. Getting better and going faster is more about intention and choices than age. The importance of goal setting cannot be underestimated. Impossible dreams are accomplished when focusing on goals you can control. Many of our goals are unspoken, they are motivations just under the surface. It is important to get those goals out in the open. From May to September the site reopens as a skateboard park and inline-skating track. The entire Roseville Skating Center, which also includes an indoor ice rink and banquet hall, has an annual budget of just more than $1 million. Fees cover all but the city’s $50,000 annual contribution. The seventh Chhattisgarh State Speed Roller Skating Championship-2014 began on a colourful note at the skating rink near Police Parade Ground here on Sunday that saw a keen competition among enthusiastic players for the coveted medals. Olympic Gold Medalist and multi-time World Champion and National Champion Chad Hedrick joins us on this episode of Skate Talk with Boomer and the Coach! We’ll get you pumped for the Las Vegas Inline World Cup, we’ll talk his record setting day at the Northshore and we’ll even talk about his training. Most people’s memories of roller rinks probably include snack bars, couples skate and disco balls. But the scene at Springfield Skateworld on Sunday looked more like an Olympic meet. Inline speed skaters from as far away as Tennessee, Texas and Louisiana made the trip for a competition that features skaters ranging in age from 4 to 60. “It’s all about prevention,” according to Glowney. Glowney and Bookwalter agree that means solid sleep, good nutrition, low stress, and training smart. The New Zealand team is finding the competition hot on the road at the World Speed Skating Championships in Argentina. There is a huge controversy surrounding the 1000M senior ladies race, after American Erin Jackson easily defeated all the competition to get the gold, unfortunately she was unfairly disqualified about 5 minutes later, supposedly by pushing a Korean girl into the ground. FOUR IN A ROW: New Zealand speedskater Peter Michael wins gold at the world championships in Italy in 2012. Kapiti speedskater Peter Michael is on top of the world again. Michael won the 15,000m elimination race in Rosario, Argentina. It was the 25-year-old’s fourth consecutive world championship title, which lifts him into an exclusive group of elite New Zealand’s sportspeople who have managed that feat. 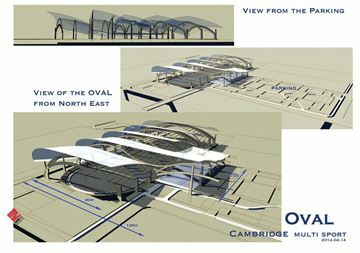 Build it and they will come – A conceptual drawing of what the multi-sport oval complex would look like, with a 400-metre speed skating oval as the feature attraction. The idea would be to possibly include volleyball courts, tennis courts, a running track, a sports retail store and two small restaurants. Morrison also wanted to dispel any idea the oval is just for Cambridge skaters. With the closest outdoor oval being in Ottawa – which is in use for about two months in the winter and still brings in thousands of users – he can see people from the surrounding areas using one in Cambridge. He has already been told by the Toronto Inline Skating Club to keep them in mind for a place to train or hold competitions in the summer when the ice is out. Christchurch’s world junior contender Ollie Jones was impressive, taking 30 seconds off a long-standing 5000m record that was no longer a standard distance for men’s indoor national titles. Jones also dominated the other events. While not in full training, South Canterbury’s Nicole Begg was still able to show her class, by clocking 31.895 for the 300m time trial, recording the second fastest time of the day behind Jones’ 30.463 seconds. Colombia works at top speed with a short list of 32 athletes with a view to the World Skating Championships to be held from next November 7 in Rosario, Argentina. The group will travel today to the South American nation to give the finishing touches on its training before the start of the World Cup. McKenzie Browne laced up her pink and red plastic Barbie skates in preparation for the 2003 SportsFest 5K race around Dieruff High School. Then 8 years old, McKenzie was ready to take on this new sport. So, you have heard that inline skating is a good form of exercise. But afraid since you haven’t tried inline skating before? Here are some tips to help you overcome your fear.